For an updated version of this Speed Booster with improved optics, please see the Metabones Canon EF Lens to Sony E Mount Camera T Speed Booster ULTRA II. The Metabones Canon EF Lens to Sony E Mount Camera T Speed Booster ULTRA is an adapter that allows you to mount Canon EF lenses to crop (APS-C) sensor Sony E mount cameras. It is particularly designed for Super35mm sensor, E mount cameras such as the Sony FS5 and Sony FS700 but also works great with smaller NEX APS-C sensor cameras, such as the a6300. This adapter maximizes a full frame EF mount lens' angle of view and provides a 1-stop increase for the connected camera. This allows a Sony E mount APS-C sensor to use more of the light gathered by an EF lens, which effectively reduces that lens' crop factor while making available to the sensor an additional 1 stop of light for each aperture setting. The T Speed Booster ULTRA supports electronic communication between the camera and lens, including AF, IS, and EXIF (where applicable). Usage of this adapter with Canon EF-S lenses is not recommended due to the 1.6x crop image circle of EF-S lenses and the Sony NEX 1.5x crop factor sensor. EF-S lenses can be used but expect vignetting and experiment at your own risk. To connect EF/EF-S lenses on full frame sensors, like those found in the a7 series, the "Auto APS-C Size Capture" feature must be used. • This adapter comes with a 1/4-20 thread socket in the foot for mounting stabilization onto the adapter to take stress off of long lenses. Canon EF 135mm f/2Lor the connected camera. If you do not want this, consider a Smart Adapter instead. • Usage of this adapter with Canon EF-S lenses is not recommended due to the 1.6x crop image circle of EF-S lenses and the Sony NEX 1.5x crop factor sensor. EF-S lenses can be used but expect vignetting and experiment at your own risk. • To connect EF/EF-S lenses on full frame sensors, like those found in the a7 series, the "Auto APS-C Size Capture" feature must be used. 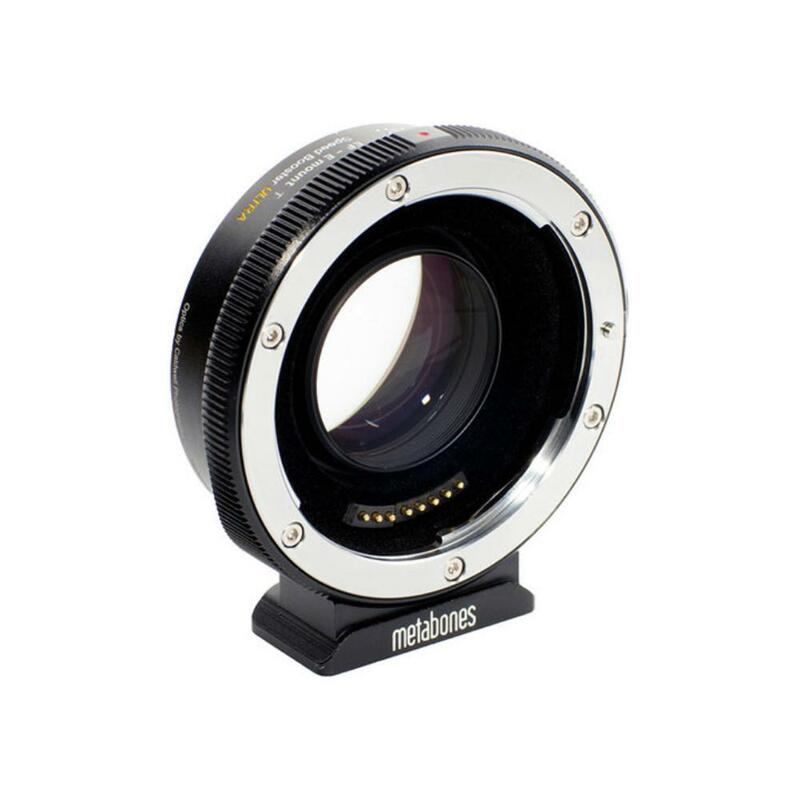 • The primary difference between this Speed Booster and the Metabones Canon EF Lens to Sony E Mount Camera Speed Booster ULTRA is that this T ULTRA version has flocking material coated on the inside of the adapter to reduce internal reflections.